Have you ever bitten down only to realize that your filling wiggled? It can be a worrisome feeling. Is your mouth going to hurt? Did you swallow any of the filling? Changes are, if your filling just wiggled, then it is simply loose. However, if the filling then pops out, make sure to retrieve it and save it for your dentist. They may want to see what it looks like so they can compare it to what is there, as that will tell them if there was any further decay under the filling. Fillings were not meant to last 50-100 years. They simply cannot last that long with all of the pressure they are constantly under. So, due to the fact that they have a lifespan, they many times do become loose or fall out. If you notice a loose filling, first, stop eating if you were, as eating with it loose may cause it to come out. Next, clean the area around the filling, ideally by brushing gently. From there, cover the filling with a bit of dental wax or a temporary filling material. Then, contact your dentist. Your dentist is going to want to see you as soon as you two can work out an appointment time in most cases. They understand how much a missing filling can hurt, and want to try and avoid that on your behalf. They will have you come in, examine the filling and tooth, and determine what the next step should be. 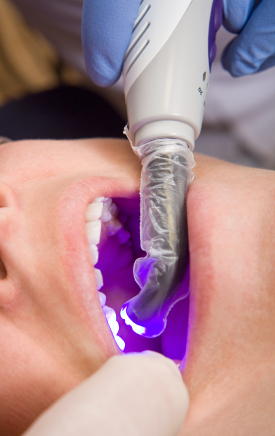 In many cases, they will want to remove the old filling and put in a new one. This is usually the best option, as it securely reattaches the filling to the tooth, giving you peace of mind and normal functionality.